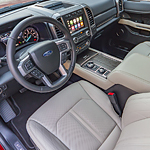 Tech Features That Border on Luxurious | Richardson Ford Inc. The Expedition eliminates the need to rely on your phone's data or some other expensive wireless connection. With FordPass Connect, you can establish your very own Wi-Fi hub inside the Expedition's cabin. Speeds are 4G LTE thanks to AT&T, and the in-cabin network supports up to 10 devices within a range of up to 50 feet. Enjoy Wi-Fi on the road, while tailgating or camping in remote locations. Ford+Alexa via AppLink integrates Amazon Alexa voice-control capabilities into your Expedition's Sync3 infotainment system. With Alexa's help you can access most of Sync3's features hands-free, including traffic info and voice navigation. Why not explore the Expedition's tech features for yourself? Visit us today at Richardson Ford Inc. for a test drive.